Kionte Storey joined the Marines shortly after high school wanting to travel the world. He describes serving as being like nothing else, and he loved the brotherhood and camaraderie. After doing a tour to Iraq in 2008-09 as an Infantryman with the 3rd Battalion, 7th Marines, Corporal Storey did his next deployment to Afghanistan in 2010. Five months into that deployment, on Sept. 7, 2010, Cpl Storey lost his right leg to an improvised explosive device (IED) while on a patrol in Sangin. Kionte acknowledges his recovery was initially difficult. The challenges of dealing with his injury led him into a depression. He overcame this emotional hurdle by becoming more active and now enjoys testing his physical abilities by running, hiking, rowing, and weight lifting. He has become an avid mountain climber and conquered Mount Kilimanjaro, one of the seven summits around the globe. He has completed the Marine Corps marathon, several half marathons for Team HFOT, and competed in track and field events during the 2012 and 2016 Paralympics Nationals. He hopes his achievements will inspire and motivate others. “Anything is possible. Just because you’re injured, your life does not have to stop,” he says. Though Kionte excels on the track and mountain tops, he still experiences obstacles within his own home. He cannot access the bathroom in his wheelchair, causing him to crawl on the floor. He has often fallen trying to get in and out of the bathtub. A specially adapted custom Homes For Our Troops home with wide doorways and a roll-in shower will allow Kionte to bathe safely and easily. Regaining his independence in an HFOT home will help him focus on his school and career. He is currently studying to become a physical therapist. Additionally, his service dog Koja will have more space. 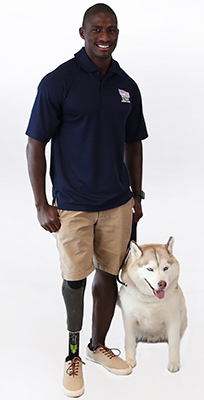 Originally from California, Kionte is choosing to build his home in the San Diego area to be close to his prosthetist and near the VA.
Kionte says he is grateful to HFOT’s donors and supporters. “Thank you for all your hard work in supporting injured Veterans and giving us a second chance at living an independent lifestyle,” he says.